Essex man and Mondeo man are stereotypical figures which were popularised in 1990s England. "Essex man" as a political figure is an example of a type of median voter and was used to help explain the electoral successes of Margaret Thatcher in the previous decade. The closely related "Mondeo man" was identified as the sort of voter the Labour Party needed to attract to win the election of 1997. Although the Labour Party is often considered the "natural choice" for the working-class, there has traditionally been a group within that class who have voted Conservative, who are distinct from the "Essex man" phenomenon. After the Second World War, there was considerable social change in South East England. Working class English families were encouraged to leave the war damaged slums in inner London and move to newly built council owned properties in the suburbs and new towns in the home counties, including Basildon and Harlow in Essex. With the decline of manufacturing and skilled manual work in the 1980s, this group increasingly looked to middle-class professions for employment, or became self employed. Their children enjoyed housing, education and employment opportunities far removed from the experiences of their parents. Margaret Thatcher's policies from 1979 to 1990 included: lower taxation, control of inflation and sale of council housing stock at subsidised prices. These policies (in particular, the right to buy scheme) are thought to have caused many people who had traditionally voted Labour in Essex to switch their allegiance in the elections of 1979, 1983 and 1987. The Oxford English Dictionary (OED) lists the earliest reference to the Essex man as one from 7 October 1990 in The Sunday Telegraph, although a reference to 26 January 1990 issue of Campaign: "Representative [David Amess] of new Essex man, working class, father electrician, right wing, keen hanger, noisily rambunctious, no subtlety". Owing to the similarities between the politics of Thatcher's Britain and Ronald Reagan's America, the contemporary term "Reagan Democrat" is roughly analogous to "Essex man". 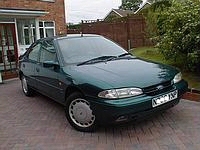 A 1995 Ford Mondeo that a "Mondeo man" may have aspired to own. His dad voted Labour, he said. He used to vote Labour, too. But he'd bought his own house now. He'd set up his own business. He was doing very nicely. "So I've become a Tory" he said. In that moment, he crystallised for me the basis of our failure... His instincts were to get on in life. And he thought our instincts were to stop him. But that was never our history or our purpose. This is the story that is often credited with inspiring Blair's concept of New Labour, and the "Mondeo man" superseded the "Essex man", as the target of the campaign for the general election of 1997 for the Labour Party. (By 1993, the Sierra had been replaced by the Mondeo in the Ford model range, hence the misquote that gave birth to Mondeo Man). Blair subsequently won the general election of 1997, with a record landslide majority of 179 MPs. Prostitutes gave the nickname "Mondeo man" to Steve Wright, who murdered five prostitutes during the end of 2006. Every constituency in Essex voted 'leave' in the 2016 referendum to leave the European Union. In particular, the Essex districts Castle Point and Thurrock ranked among the top five districts for the percentage of Brexit votes. ^ Biressi, Anita; Heather Nunn (2013). Class and Contemporary British Culture. London: Palgrave Macmillan. pp. 23–37. ISBN 9780230240568. ^ "Two of UK's top Leave districts in Essex". BBC News. 2016-06-24. Retrieved 2018-02-12. ^ Vidal, John (2016-06-21). "Brexit-on-sea: Why do voters on Essex's protected coast want out of Europe?". the Guardian. Retrieved 2018-02-12.